Have you ever considered using cloth diapers for your newborn baby? Take a second to think about it and try something new, at least for the first few months! The benefits are quite amazing. Aside from the obvious cost savings, many new moms are not aware of the health benefits and environmental advantages. Using cloth diapers is a cost-effective and greener way to diaper your baby. Cloth diapers have come a long way and are not what they used to be. 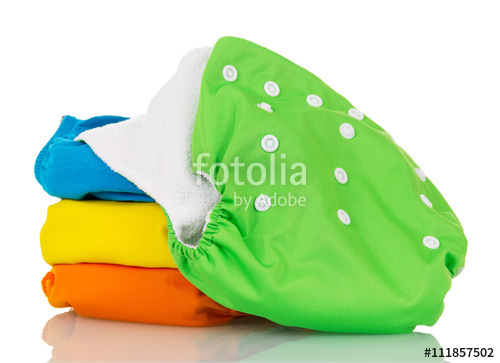 Today there are many products to help make cloth diapering as easy as disposable diapering. There are so many advantages to choosing cloth diapers over disposable diapers. Disposable diapers are quite expensive. For your baby’s diapering years you could easily spend upwards of $1000.00 per year in disposables. Using cloth diapers will run you an initial investment of under $200 for the diapers and covers, and then you are all set until potty training. This is not your mothers or grandmothers cloth diapering experience: no more pins, leakage from the sides, or diapers falling off your baby’s bottom! Cloth diapers now come in a range of styles, colors, sizes, shapes and a variety of fastenings. In addition, personalized options are available to meet your specific diapering needs. You will also find a large selection of fashionable designs, fabrics and prints to reflect your baby’s unique style. What are some other advantages for using cloth diapers? ● Eco friendly-disposable diapers will sit in landfills for hundreds of years, creating toxic waste in our environment. There are billions of disposable diapers dumped in landfills each year, accounting for tons of waste. Solid waste in a cloth diaper ends up in the toilet, where it belongs, and not sitting in landfills where viruses and disease can thrive. ● Better for baby’s bottom-plastic disposable diapers contain many harmful chemicals that make them super absorbent. These chemicals come into contact with your baby’s skin and urinary track. Not only is that a lot of chemical exposure to your baby over 2-3 years of diapering, but you also tend to change your baby less often because of that super absorbency. When using cloth diapers, you will have to change your baby’s diaper more frequently, thereby minimizing not only exposure to the toxins in the disposable diaper, but also exposure to their own urine and stool. ● No more diaper rash-cloth diapers are natural and organic. Your baby will experience little or no diaper rash, and no need for diaper creams. This is because of the gentler materials against their bottom, and more frequent diaper changing. ● More comfortable for baby-cloth diapers are softer on baby’s skin and provide better air flow without having a plastic coating on the outside. They are also softer and cuddlier for moms. ● Easier potty training- your baby will develop more of an instinct of what being wet and dry is like, because there are no chemicals holding the wetness off of your baby’s skin. Many parents who use cloth diapers claim that potty training is easier, and earlier than disposable diaper wearing babies. How do I cloth diaper my baby? Cloth diapering has never been so easy! You can use an all in one diaper-which have snap or velcro closures, providing a comfortable and snug fit for your baby. These designs make cloth diapering as easy as using disposable diapers. Many of these diapers come with waterproof covers and bamboo inserts, which are soft and absorbent materials that soak up moisture, maintaining dryness and comfort for your baby’s bottom. Inserts can also be purchased separately. One recommended product is Naturally Natures Cloth diaper inserts, which have 5 layers, and is made from bamboo viscose fiber and polyester. These fibers wick moisture away from your baby’s sensitive skin. If you prefer to use standard cloth diapers, you can purchase inexpensive diapers at stores like Walmart, Buy Buy Baby, Babies “R” Us, or on Amazon. If you do not wish to wash your own diapers you can use a diaper service such as Diaper Kind, Tide Didee Diaper Service, Baby Diaper Service, or Eco-Baby Cloth Diaper Service. You can use the Internet to locate a diaper service in your area. BumGenius Freetime- all-in-one- one-size cloth diapers- available with a snap or hook & loop closures. Don’t be nervous! These are all are very easy to use, and can be very stylish as well. You will need approximately 30-40 diapers to get you through 3 days. If you use diaper covers or shells, you will also need about 5-6 shells. Washing a cloth diaper is also easy. Simply flush the solid waste down the toilet, rinse, wash, and dry your diapers just like a regular load of laundry.